Vonnegut’s full-blown disillusionment with the modern world is clearly outlined in this book. It’s cynical and readers can draw parallels to current events. Yet, it is also fun to read and laugh over the satirical tidbits. It’s been a while since I last read something by Kurt Vonnegut (4 years actually) and I remember enjoying it as a youngster. 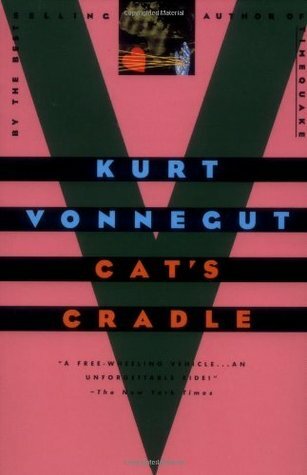 Cat’s Cradle follows in the same vein as Slaughterhouse-Five in terms of satirical humor, caustic remarks, and epigrams. Vonnegut’s writing style is sure unique, I thought. Cat’s Cradle relies heavily on a single character’s driven determination to uncover more information about a famous scientist who helped build the atomic bomb in WWII. This then leads to him encountering more people in his search and a ridiculous string of events that follow. Although the story is arranged into chapters that are the length of one or two pages, the plot is composed of implicit sections in which each take a turn into specific directions. Nevertheless, the short chapters effectively shows the reader independent thoughts and occurrences that eventually intertwine to coherent form the grand picture. The absolute ridicule that Vonnegut attacks religion with should not be taken seriously. Although there’s a lot of serious issues that he touches upon, he writes about it in a cavalier way that shows how little he’s invested in it. For me, it was a book I would want to read if I wanted something relaxing. The ending is actually tragic but I wouldn’t put too much thought into it. My point for reading it was not for the story line but for the philosophical theses. Anyways, I’ve come to the conclusion that I cannot take any Vonnegut that I read seriously.